The studio is supposedly aiming for a PG-13 rating, following the success of other, more family friendly films. There are rumors that Universal, the studio that owns the movie rights to the Doom games, is planning a big screen reboot, barely six years after the original movie came out. 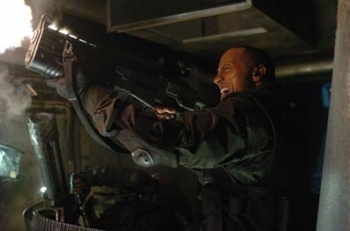 The 2005 movie starred Karl Urban and Dwayne "The Rock" Johnson as part of a futuristic military team sent to investigate a distress call from a Martian outpost. The rumors seems to have started on the Australian movie site, What's Playing. According to the site, Universal is looking for scripts, and particularly ones that make good use of 3D. Anyone who has seen the first Doom movie will probably remember the first person section near the end. Silly as it was, it would actually have been a good fit for 3D, so it's quite likely if these rumors are true, we'll be seeing it again. What's Playing suggests that the success of Paramount's GI Joe: Rise of Cobra inspired Universal to look into revisiting the property, despite the first movie flopping at the box office. This probably means that the movie will be aiming for a PG-13 rating, which doesn't automatically mean it will be bad, but it doesn't lend itself well to a faithful rendition of the source material. Of course, that assumes that there's any validity to these rumors, and they're a little too vague to be really believable right now.